HowMutch Will Brands Pay To Get You To Answer Questions About Their Products? Social Q&A sites seem to be springing up all over the place these days. There’s Quora and Formspring, and even the way you train Hunch is by answering a series of personal questions. But those are all general purpose question sites. A brand new site called HowMutch cuts right to the chase and only asks one type of question: How much would you pay, or would someone have to pay you, to do X? How much would someone have to pay you to lick a subway pole? How much would you pay per month for unlimited coffee at Starbucks? 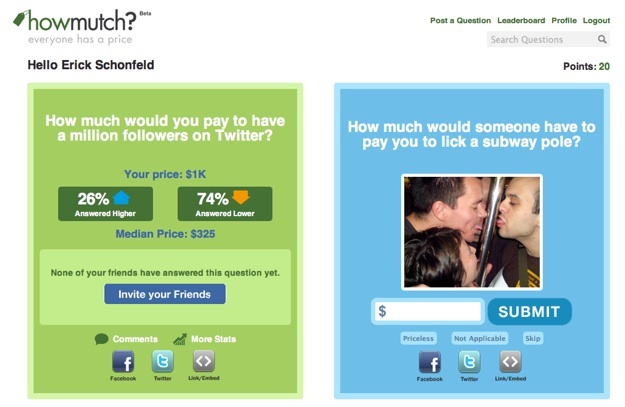 How much would you pay to have a million followers on Twitter? How much would you pay to have lunch with Fred Wilson? After you answer, it tells you how your price compares to the median price everyone else gave. You can also see more stats, or ask your friends on Facebook and/or Twitter to answer the question. It’s pretty simple, but the questions are fun,and you get immediate feedback when you see how everyone else answered the same question. If HowMutch can gain a following of people to come back and keep answering questions, it can start inserting questions from companies and brands. “Charging brands for their own questions is the business model,” confirms CEO Ari Greenberg. For instance, Starbucks might want to know how much people would be willing to pay for an unlimited amount of coffee. Amazon might ask how much a subscription to every book on the Kindle might be worth. Big companies already routinely pay for this kind of research, as much as $500 to $1,000 per question for a national sample of consumers. HowMutchwill also collect demographic information, which brands require. But the trick will be to make the branded questions just as interesting as the other ones. Before any of that happens, however, it has to attract consumers to its site. How much would they have to pay you to answer these questions, or would you answer them for free?